Party sources said K. Chandrasekhar Rao is keen to advance the polls ever since he met PM Modi in Delhi on June 15. 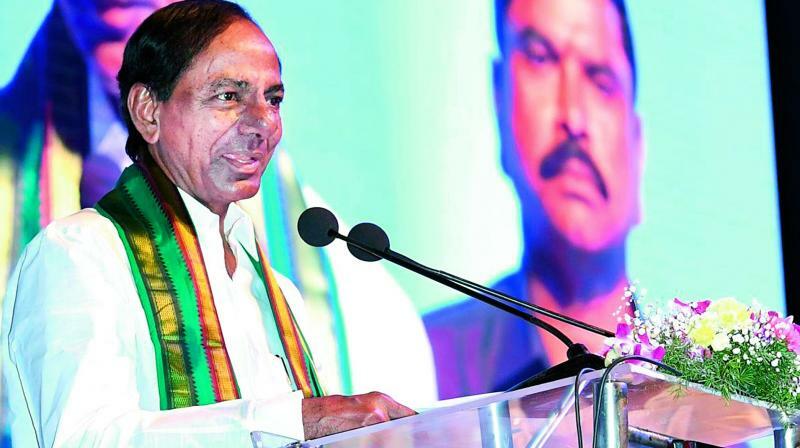 Hyderabad: Chief Minister K. Chandrasekhar Rao on Sunday hinted at “advance polls” in Telangana state. Addressing a meeting at Telangana Bhavan on the occasion of city Congress leader Danam Nagender joining the TRS, Mr Rao said the TRS is ready for early elections and challenged the Opposition to clarify whether they too were ready. TRS sources said the Chief Minister wants Assembly elections to be held in November/ December this year along with elections in Rajasthan and Madhya Pradesh, and is likely to request the Election Commission accordingly. The Lok Sabha and TS Assembly polls are due in April-May next year. There has been talks of holding simultaneous polls as also speculation that the general election could be advanced to the year end. Speaking on the occasion, the CM said that the latest survey by various independent agencies revealed that the TRS would win 100-plus Assembly seats out of 119 in Telangana. He added that he would release the detailed survey results in three or four days. He said even if all other parties join hands against the TRS, they cannot defeat the TRS which has over 50 per cent vote share in 100 constituencies and 60 per cent vote share in 85 seats as per the survey. “We are ready for advance elections. Even people are ready for advance elections. I ask the Congress and other Opposition parties to tell whether they are ready. If we go for elections, it will reveal whose strength is what and where each party stands. “If Opposition parties don’t stop mudslinging on the TRS government, then we will be forced to go to polls to prove who the people are behind. That day is not very far off,” Mr Rao remarked. The party sources said Mr Rao is keen to advance the polls ever since he met Prime Minister Narendra Modi in Delhi on June 15.